Clueless, that's how I am towards the ropes of marketing. I know it is a bagful of sneaky twists and turns but after reading Marketing for Entrepreneurs, I am under the impression that marketing isn't that bad at all. It is a great take heed workbook that can really get one going. It has brief chapters, lots of examples, precise chapter summaries and interesting exercises for field applications. In fact, I am so excited to try out some if not all of the exercises the book recommended the reader should do. My copy right now is filled with blue post-its, it's crazy. 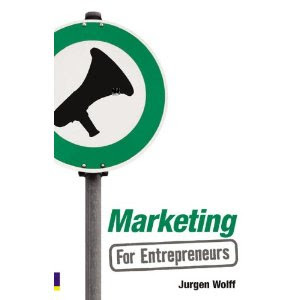 If you're in the same field or if you're interested in starting up your own business or brand, Jurgen Wolf's Marketing for Entrepreneurs is an easy-to-approach how-to guide. I recommend it for people, who like I, would like to know more about how proper marketing can benefit a business--or one's career OR even, self. Marketing for Entrepreneurs is available at all leading book stores.